The New Nicotine Alliance (NNA), a UK registered charitable incorporated organisation “concerned with improving public health, through a greater understanding of “new” (risk-reduced) nicotine products and their uses” is supporting an initiative by French organization SOVAPE. Last January, the EU Commission delayed a decision on whether to impose the infamous proposed EU-wide tax on vaping products until 2019, as until now they did not gather enough data to justify the move. What’s important now for me as a consumer is what you guys do when you leave here, as groups or as individuals. A lot of people are rightly looking to the UK as being a good place for harm reduction, particularly in this field but again, being a Scotsman we don’t particularly like the UK and we’ve got a little saying that says “we’re daein well but we’re no daein great”. I’ll translate that into English for you: “We’re doing very well but we’re not doing brilliantly”. While the World Cup is currently taking place, the Scottish Government has marked the feast of sport taking place in Russia by scoring something of an own goal. This week saw the publication of the Scottish tobacco control plan (TCP) led by Minister for Public Health and Sport, Aileen Campbell and – while there are many friendly references to e-cigarettes contained within it – it is somewhat schizophrenic when it comes to its approach to harm reduction overall. Duncan Selbie, Public Health England has proclaimed that “Britain is winning the war on tobacco”, which for many in ‘public health’ is what it is all about. Sod the Proles and their little enjoyable vices. ‘Public health’ have set targets and by Jove, they’ll be met! Western Trust were the first to break the news this week, quickly followed by Royal Free London and Milton Keynes University Hospital, that vaping is now banned on all of their property. It runs contrary to the advice given out by the Royal College of Physicians (RCP) last week. So, in a bid to really help smokers quit, NHS Trusts are lining up to promote abstinence or repeatedly failed NRT products. Vapers are being told they can’t vape, and smokers are not being offered it as a means to switch to something over 95% less harmful. “What’s wrong with that bag?” said the custom’s official. “Everything,” said his colleague. In an article on it’s website, the NNA explained that it has already successfully fought for the right of vape reviewers, to be able to continue sharing their opinions and insights with fellow vapers when the TPD was threatening a ban on marketing across borders. Martin Cullip from the organization is pointing out these efforts will have been wasted if YouTube keeps bypassing what is ultimately a democratic process, and keeps censoring reviews on the basis of unfounded moral panic. 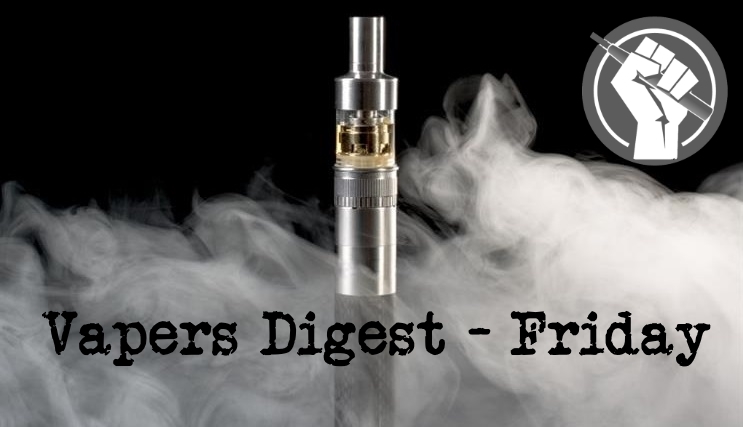 A recent journal commentary entitled “Are e-Cigarettes Tobacco Products?” has caused a flare-up in the simmering bickering on the point. Such disputes are usually anchored, on one side or both, on the incorrect notion that there is some existentially correct rule for defining this (or any) category. The tone is often reminiscent of a child who just learned that tomatoes are a fruit, in terms of plant anatomy, arguing with his classmates who insist they are vegetables. Proposals to raise the legal age to purchase tobacco products have been working their way through cities and municipalities for roughly ten years. In 2013, New York City– known for its aggressive tobacco control policies–was the first major US city to raise the minimum age to purchase tobacco and vapor products to 21. In 2015, Hawaii became the first state to pass legislation that raises the minimum purchase age to 21. The electronic devices provide smokers with the nicotine they’re addicted to but without the harmful chemicals that come with tobacco cigarettes. Chairman of the Australian Tobacco Harm Reduction Association Doctor Colin Mendelsohn believes Australia is falling behind the rest of the world. “There’s about 40-million users in the world,” he tells Michael McLaren. “In England there are about two million vapers who have now quit smoking and 770,000 who have quit both smoking and vaping. It is interesting to apply current thinking to decisions taken years ago. Whilst our greater knowledge today can make previous behaviours and thinking seem odd or plain wrong, there are also instances when applying today’s approach would have stopped progress. In the 1960s it became apparent seatbelts reduced harm from use of motor vehicles. Whilst the vast majority of users got from A to B safely, there were (and still are) car collisions causing death or serious injury. On June 18, 2018, U.S. Food and Drug Administration (FDA) Commissioner Dr. Scott Gottlieb delivered remarks on “FDA’s Nicotine and Tobacco Regulation and the Key Role of Regulatory Science” at the Tobacco Regulatory Science Program Meeting. While addressing the importance of regulatory science to inform FDA’s Center for Tobacco Products (CTP) regulatory efforts, Commissioner Gottlieb focused a portion of his remarks on the use of Electronic Nicotine Delivery Systems (ENDS) as smoking cessation tools and FDA’s role in their regulation. Imperial Brands Plc is launching a vaping product to compete with Juul Labs Inc., as Chief Executive Officer Alison Cooper steps up efforts to reassure investors that smoking alternatives are an opportunity rather than a threat. This month the maker of Winston cigarettes is releasing new vaping pods in the U.S. and U.K. containing nicotine salts, which allow the stimulant to be absorbed into the bloodstream more rapidly than when using a conventional e-cigarettes. The nicotine formulation is similar to that used by Juul, which has grabbed a 68 percent share of the U.S. retail market for vaping devices in just three years, according to Nielsen. What do you do if you feel like your batteries are hotter than normal? Or have you noticed they may be leaking, making funny sounds, change their shape or are giving off a strange smell? The St. John’s Regional Fire Department is reminding the public of these issues specifically when it comes to using lithium ion batteries. These batteries are used to power so many of our devices today, items like our smartphones, laptops, scooters, e-cigarettes, smoke alarms, toys and even our automobiles. Vaping and use of other electronic tobacco delivery products are now banned in the workplace. Gov. Gina Raimondo just signed a bill into law, adding the use of e-cigarettes, vaporizers, and similar products designed for electronic, vapor or aerosol delivery of nicotine, to the definition of “smoking” in the Public Health and Workplace Safety Act. The government will impose a 57 percent tax on electronic cigarettes, but its implementation has been postponed from July 1 to Oct. 1. The Finance Ministry’s technical and excise director, Nugroho Wahyu, said selling e-liquid without the additional tax was still allowed until Oct. 1. Simon Chapman, for many vapers, exists in a realm occupied by Stanton Glantz and Martin McKee. It’s a land where alternative facts abound, where the three of them leap about with their eyes closed and mouths permanently gushing nonsense. It could be entertaining were it not possible that their utterances have the distinct possibility of keeping smokers smoking and not switching to electronic cigarettes. Unless you count the so-called Islamic State, only one country in the world has a ban on tobacco sales. Starting in January 2011, Bhutan experimented with prohibition and started throwing people in jail for possession.